This was the first Western adventure I’ve ever read. I didn’t know what to expect, would I like a Western setting? (I don’t particularly like Western movies, for example). The cover really caught my attention though (shallow, I know, but who doesn’t let the cover influence their choice of books?) and I decided I wanted to give it a go. Also, this is kind of a horror story. After reading The Shining when I was a little girl, in a little cottage in the Arden, I stayed well away from everything horror. (I mean, the pipes were creaking in that place, I was scared to death). So this was kind of an adventure for me. But it turned out to be one hell of a great adventure! The great thing about “The Six-Gun Tarot” is that we don’t get one, or a few main characters, we get a whole city, with just a few standing out. We get to follow various storylines, bringing all the characters and their surroundings to life, which makes sure this book never gets tedious. Although this is a book told from a third-person perspective, we are part of the feelings and thoughts of certain individuals throughout the story. In the beginning of the book there was a lot of shifting between these individuals without a real indication that the perspective was changing, which got me a bit confused. But as I got further into the novel I adjusted to this way of storytelling and I didn’t bother me anymore, the shifts didn't occur so close together anymore either, so maybe that has something to do with it. I haven’t read many books told in this fashion, so it took a little getting used to, but it worked out fine in the end. Putting that aside, the writing is brilliant! Sharp and beautiful, a delight to read! Belcher fills his cursed mining village Golgotha with an interesting cast of characters, living their dark, secretive and mostly hidden lives in a desolate place across the 40-Mile desert. He describes every aspect of the town and its inhabitants with such intricate detail, it feels like a movie is playing inside your head, it’s all so easy to imagine. Every new character we meet comes with a little anecdote or history, as to establish them in the story, making it easy to tell everyone apart. It also gives a certain richness to the story he wants to tell. By using flashbacks for a few of the characters, we get to know the depth of their supernatural traits. How did they get them? And more importantly, how did they end up in Golgotha, which seems to draw beings of the supernatural to it? I loved how dark this book was, the horror aspects weren’t overwhelming, but placed just right. What I loved even more were the few moments of light throughout the story. Love, friendship, the caring for one another also gets a place in this novel and these moments are a fantastic addition to the dark side of the story. Dark and light intertwine and it fits just right. The author uses some heavy topics in this book: racism, religion, homophobia (well, it was in the early days, so it is kind of part of the society back then, but hooray for including the love between two men here!). It doesn’t put a weight on the novel though, it all gets its place within the story, religion even being a huge part of the plot. What started out as a story about a boy on the run, protecting the last thing he got from his father, a mysterious jade eye, turns into an epic battle between good and evil. 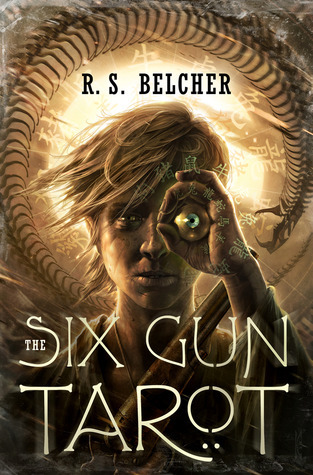 With this sublime mix of Fantasy, Steampunk, Horror and Western adventure in “The Six-Gun Tarot”, R.S. Belcher is sure to be one of the most promising debut authors of 2013 in the scene.